If you’ve owned a console in the last two decades – and have a passing interest in Japanese RPGs – there’s a very good chance you’ve played at least one of the Tales games on your travels. There are so many entries (not counting the ludicrous number of spin-offs) it’s a surprise it’s taken this long for one to arrive on Switch, but arrive it has, bringing a port of one of the series’ most beloved instalments to Nintendo’s handheld hybrid. It’s been over a decade since Tales of Vesperia first brought the franchise into the wonderful world of HD, but time has been mostly quite kind to this plucky little adventure. 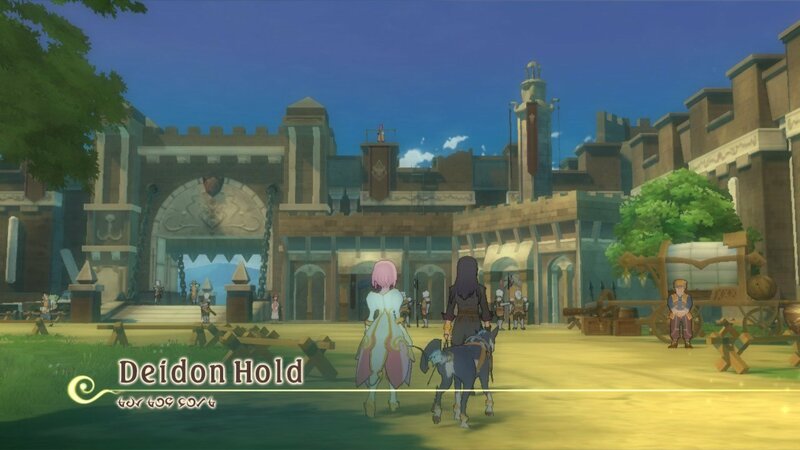 From the tongue-in-cheek humour of its voiceover (available in both Japanese and the English dub) and its almost cel-shaded anime visuals to the engaging mix of tactical and isolated combat, Vesperia made just enough changes to the franchise’s formula to keep it from feeling worn out. Here and now with its new Definitive Edition, veterans can return to an old favourite with some new content, while fresh players can enjoy a classic in its fullest form. Those HD graphics have been given a lovely spit polish (although some assets do look a little jaggy when forced into a closeup during cutscenes), there are new music additions to the score and all the content that was previously locked to the Japanese PS3 port from 2009, which includes two extra characters and all manner of DLC costumes. It was a big game over a decade ago, but now it’s just that bit bigger without bringing down the quality of the overall package. Performance-wise, it runs brilliantly in both handheld and docked modes. 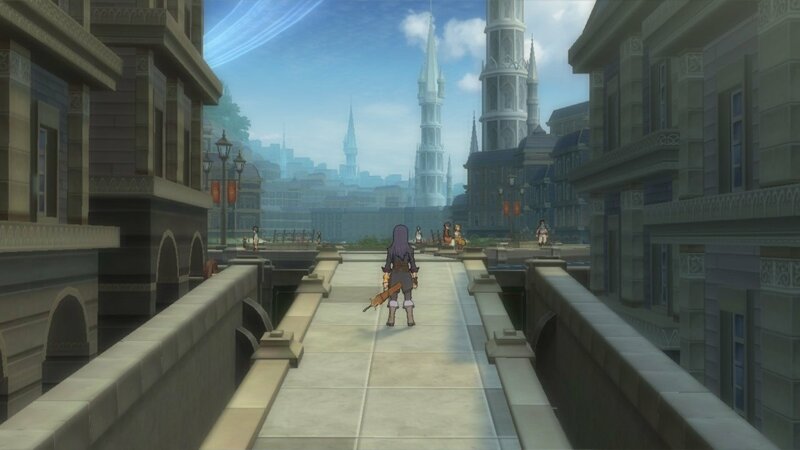 Vesperia follows the story of a group of warriors, thieves, nobles and pirates living in a world on the verge of unrest. The people of Terca Lumireis have become dependent on an ancient technology known as blastia to power their everyday lives (including protecting their homes from monsters that lurk in the wilds), but there’s a conspiracy at play in the Empire and beyond that could bring doom to the land. In the boots of former Imperial soldier Yuri Lowell – voice by the insanely talented Troy Baker in the English dub – you’ll form some unlikely alliances and create a new guild to help solve the mystery behind the missing blastia in classic JRPG fashion. On paper, it does sound like the usual rote story you get with countless other JRPGs but even with the occasional bit of clunky translated dialogue, the group that forms around Yuri never feels two dimensional. Yuri is headstrong and sarcastic; Estelle is confident yet cautious; Rita is prickly and self-serving. Everyone brings something new without feeling like a repeat of the previous Tales games, or any other game from any other franchise in this crowded genre. Even Yuri’s canine companion Repede – complete with a scarred face and a pipe – adds a little humour in for good measure. 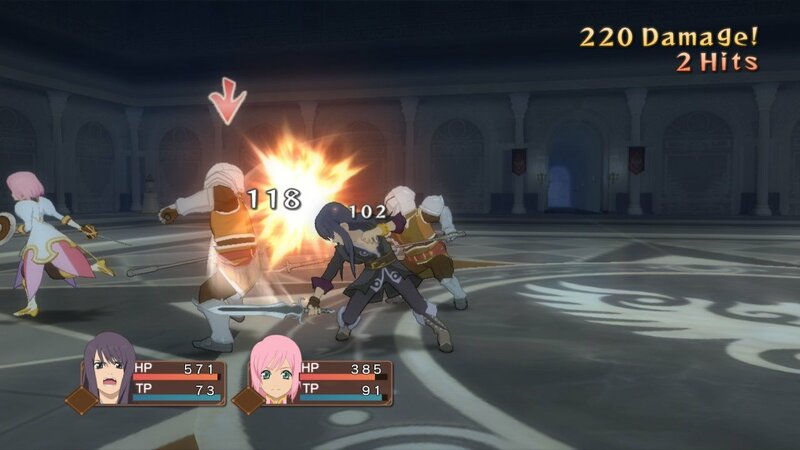 While it might look like a traditional JRPG, Vesperia instead uses a unique combat model that eschews traditional turn-based battles and pure real-time action in favour of something which sits in-between the two. The Evolved Flex-Range Linear Motion Battle System – which takes inspiration from the series’ Linear Motion Battle System – functions more like a fighting game, drawing you into an isolated arena every time you encounter an enemy (like a turn-based affair) before allowing you to unleash attacks and combos like a more basic version of Tekken or Virtua Fighter. You’re locked onto a fixed axis, but you can switch between the one or more enemies you’re battling, combining basic attacks, blocks and Artes (special moves) that are unique to each character. Hit a foe enough times and you could launch a critical Fatal Strike (which can be particularly handy against a boss). Your party will attack automatically around you, but you can customise its composition and their attributes in order to maximise their use in battle. You can even use that familiar ability to sneak up on enemies to gain an advantage before a fight begins. For newcomers, it’s a very odd system to grow accustomed to and it’s very easy to lose simple battles due to its fighting game-influenced mechanics (such as how enemies can grief your health even when blocking unless you catch them with a counter combo). Much like everything from the size of its hub-like cities to the way characters offer internal insight into the story (known as ‘Skits’) as you progress, these elements all work really well together – even if very few of them feel substantially different from many of the Tales games that preceded and followed. 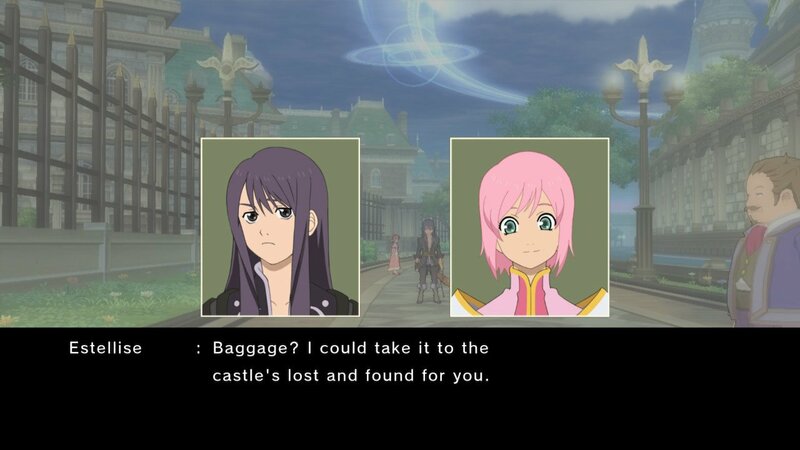 While Tales of Vesperia: Definitive Edition doesn’t make an major changes to the original game that launched over a decade ago, it does combine practically every piece of exclusive content into one wholesome package. With the benefit of some improved visuals in both cutscenes and gameplay, it’s very difficult to recommend this JRPG classic on any other system than Nintendo Switch thanks to how well it performs in both docked and handheld modes. If you’ve ever slept on this classic, there’s never been a better way to rectify that error. Haaaaaaaaaaaaaaaaaaaaaaaaaaaaaaaaaaaaaaaaaa 8 Great, who'd of thought it. I want this game. But I also want to save money. Arriving this Friday. Hope this does well! Never managed to jump into JRPGs properly (except Kingdom Hearts), but the Tales series has always coloured me intrigued despite never playing one. "With the benefit of some improved visuals in both cutscenes and gameplay, it’s very difficult to recommend this JRPG classic on any other system than Nintendo Switch thanks to how well it performs in both docked and handheld modes." I think you mean it's NOT very difficult to recommend? @Perryg92 Tales games are essentially the mom's cooking of JRPGs. Not actually the best at anything but there is something comfortable and super lovable nonetheless. Should hold me over until Grandia 2. Got it preordered when Amazon Italy still listed it as a 40€ game with a 2€ Prime discount. Now it's listed for 50€. It should arrive next week! Thanks for the review. Been looking forward to this since the initial Switch announcement when it was said we'd be getting one of the Tales games. @Indielink He still means there's not much reason to get it on other platforms like PS4 and PC. I can attest to that because I do have a PS4 and a very powerful PC with an i7 8700k and 1080ti, but I'm still getting it on Switch because of the portability and it doing good in both handheld and docked. Either way you're both saying the same thing. "...doesn’t make an major changes to the original game that launched over a decade ago"
So, for those of us who played it - We wait for something new. "With the benefit of some improved visuals in both cutscenes and gameplay, it’s very difficult to recommend this JRPG classic on any other system..."
@Indielink No, it was worded correctly. Have it on my 360. But never finished it. Maybe having it on the go will give me incentive to finally get through it. Defiantly getting this and at £32 delivered its a steal! Oh and a Nintendolife 8 well that's a turn up for the books. This looks awesome. I've been wanting to get into the Tales series for some time now and it looks like this is one of the best places to drop in. However, since I'm currently busy with Smash Bros. and Phantasy Star 4 on the Genesis Classics Collection, I'll have to pass on it for now. However, since it's a Bamco game I'm sure it'll be on sale sooner rather than later, so I'll probably pick it up then! Yes I most definitely will be enjoying this since I missed it the first time around and the last tales games I played was Tales of Symphonia 1/2 back on GC & Wii. Hate this game and everything it represents but omg I’ve just triple-dipped. Ooooh I might just get this game. It's been on my radar and I rarely see anyone talking badly about it so it sounds like a good purchase! I love this game the first time round, and I can't wait to play this version either! This game was the only reason I held on to my Xbox 360! I love my Vita for the JRPG. But it looks like switch has definitely taken over. Vita will still get a lot love will I am catching up on my backlog. But Switch is where I be picking up games like these in the future. This excellent gem has been trapped as a 360 exclusive in the west for a decade now. Buy buy buy buy buy! You buy! Special Edition just shipped out from Bandai Namco online store. In the meantime, preloaded digital version awaits! @UmbreonsPapa Symphonia was the best ever made, I guess. I loved Phantasia and Symphonia, then played the Abyss and just really did not like it. The main characters and story were kinda annoying. Two new games for me on Friday. This is one of them. Great! It will be mine eventually! Yeesh, what's with the fuzzy graphics? Those screenshots make my eyes hurt! As someone who loves JRPG's and has never played a game in this series count me in. This is one I'm looking forward to. Not a big fan of the series overall, but I figured I should give this one a shot since if its not Symphonia then it's often this one people like to cite as their favorite in the series. Game should arrive tomorrow so hopefully I get to have a decently fun time at least. Not to true. This is the definitive edition that was exclusively available in Japan. So if you only played it on Xbox 360, you now get Flynn as a playable character and the pirate girl Patty. There was a petition on Facebook years ago asking Namco to bring it over and they responded by saying it'd never happen. So glad to see they finally changed their minds! Are those screenshots from the switch? And does the game really look like that? It's so...blurry. I know it's an older game but it was still a 360 game, so it was HD. I'm just kind of confused because Tales of Graces F doesn't look as blurry and yet that was a upscaled wii game. Actually even screenshots of the wii version of Tales of Graces don't look as blurry. What's up with that? Yup, it's a really big deal. Can't wait to play this over again on the Switch with the additional characters! This game is an 8. A 5 dollar indie game where you push different colored balls and that's the whole game, is also an 8. Rating system without a price range really doesn't make sense. So glad this isn't tied to 360 anymore, and on a handheld no less! I haven't played a Tales game in quite some time. Steadily working on my backlog and hoping to one day get to play this. @construx totally agreed. they gave Atelier game on Switch a 6. I was like you gave an indie title that's only 1/5 of that Atelier game and yet you gave it a 8 or 9. It makes sense here does it? @NEStalgia i'll have to check it out. Not sure why a 360 game looks worse than a wii one but that's not relevant. @Yorumi Bandai, XBox. There are the two reasons why an X360 game would look worse than a Wii one. Can't wait to pick up my copy of this, really excited to try a Tales game for the first time. @Antraxx777 Ahhh you are correct. I made that cooking analogy out of love. I really like the Tales games. You're lucky to have had access to this game. I bought the 360 version years ago in anticipation of backward compatibility, but they never added support. Now we know why. Ah, a fellow lover of gold, I see? I just hit 28 oz with a recent 30 gram gold panda (absolutely gorgeous), pre-33 gold $5 liberty in AU condition (nice cartwheel luster) and pre-33 gold $10 liberty in AU condition (love that cartwheel shine). This one will come home for sure eventually! After I'm completely done with Xenoblade 2. I’m buying it on PS4 instead so I can have it in the same place as Zestiria and Berseria. I also have other Tales games on my PS3. I love the Tales Of games and this is one of my favorites. @JaxonH in the current context, the digital coins on the eshop that make games discounted based on the more-than-it-should-be amount of money I’ve spent on games. @Antraxx777 Seems like Namco used to remake the original ToP for practically every console... for Japanese audiences only. Played this game on Xbox last time but never really finished it. At last now I can really put up a good effort to finish the game. Pre-odered this and Super Mario Bro U Deluxe together. Waiting eagerly to start my journey anew. I love this game! I haven’t played it since I sold all my Xbox 360 stuff. I’m looking forward to playing it this weekend! 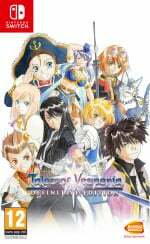 I liked Tales of Symphonia (Gamecube) far more than this one. Never had a chance to play this since I didn’t own an Xbox. Really looking forward to giving it a go. I’m a JRPG guy so this looks right up my alley. Don’t think I’ve played a Tales game since Abyss. I never played this one, but I've been a big fan of the Tales series for ages...so it's going on the list. I'm glad this is going multiplatform so everyone had a chance to play it. I hope Namco does the same to other classic Tales games too before they released the new one for Switch. Would really love to play Symphonia Chronicles, Xillian 1 & 2, Phantasia, Destiny 1 & 2, Eternia, Graces F, Hearts R, Innocence R, Zestiria, Rebirth, Abyss, and Berseria on the go. Never played a Tales game but the trailer for this has me intrigued. Is it worth getting? Should I wait to see if it ends up on sale down the road? @DarthFoxMcCloud Vesperia depends a lot on the person. It is one of the better tales games overall so you're not getting a bad one. For me it's kind of average. The battle system isn't as good as Graces, and the story isn't as well done as Abyss. Granted Abyss is in a league of it's own and I argue it can rightly stand against true literature. All that said if you're on the fence and want a decent game I'd go for it. If you're only going to be pleased with some ultimate JRPG classic like Chrono Trigger or FF6 then I'd pass it. It's good and will keep you entertained but nothing truly special. What you said is in many ways better than the NL review above. Thank you. I agree with you that this Tales game is no Terranigma (best SNES game ever), but for a 3D Japanese RPG this looks to be alright. I've not played a 3D Tales game but I've read up a lot about the Tales series. I never had an Xbox, so I'm really excited to finally play this. Tales is my favourite game series and I can't wait for my special edition to arrive tomorrow! However, Yuri, get a haircut, ya darn anime hippie! You're already bishonen enough without that ridiculous hair making you look even more like a flat-chested girl. @Heavyarms55 Actually, it sounds to me like the fighting mechanics are pretty similar to Xenoblade, just with direct control over your playable character, while the special moves are harder to use but have no cooldowns. Considering I'm non-plussed about the New Super Mario what with having it on Wii U, this is a bit double standards of me, but... Got it on 360 but HD visuals, handheld,and the extra DLC means I'm sold. However no way I can afford it at the moment so when I can hopefully a good sale. @BulbasaurusRex Well, I will be finding out probably today. I bought it now and just wanting for it to unlock. Hate when it doesn't unlock on time. Man am I struggling to get in to this game what so ever. And I've been a Tales fan since Tales of Eternia on the PSP. Just dropped 60 bucks on this, played about 15 minutes (up through the first fight) and God, I just can't. Slow, boring dialogic where you wait 5 seconds between each dialogic box as characters stand completely still... clunky-seeming battle mechanics that might be fun down the line... I used to love a good rpg, even a good Tales game... but this was a waste of money since all I could think was that I never wanted to play this again.